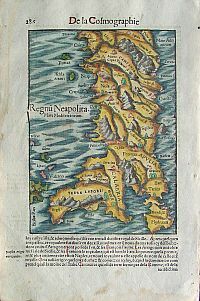 217 M�NSTER, S. La description de l'Italie selon les divers peuples� B�le, 1568. Beau col. Bois grav�. Mouillures marginales. Trous de ver. Belle impression. 242 x 172 mm. Carte montrant une partie de l'Italie, la Corse et le nord de la Sardaigne. Orient�e vers le sud. 219 PTOLEMEE / BERTIUS. 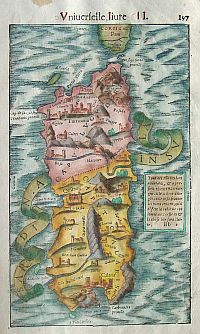 Eur : V Tab : Amsterdam, Hondius, 1618. Papier bruni, fortes rousseurs, marges fragilis�es. 330 x 465 mm. 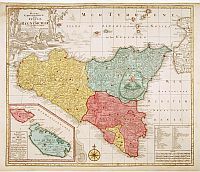 220 BLAEU, G. Nova Italiae delineatio. Amsterdam, 1635. Beau col. en partie original. Belle impression, bien contrast�e. 378 x 492 mm. 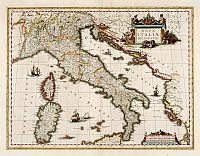 � Detailed map of Italy, Sardinia and Corsica embellished with four sailing ships, a sea monster and two very decorative scale and title cartouches. 222 LOTTER, T. C. Italia con Le sue Poste... Augsbourg, 1770. Beau col. ancien. Bel exemplaire. 510 x 590 mm. 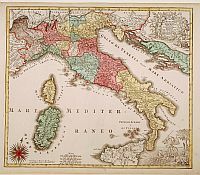 � Carte des Postes d'Italie d'apr�s Giacomo Cantelli da Vignola. T.C. Lotter married M. Seutter's daughter in 1740 and succeeded him in 1756. Lotter used the copperplate of Seutter; he only changed the name. 225 M�NSTER, S. (Naples). 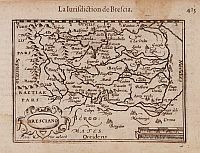 B�le, 1568. Beau col. Bois grav�. 220 x 150 mm. � Carte centr�e sur Naples et sa r�gion, orient�e sud / nord, avec la Corse. 227 LANGENES, B. Bresciano. Amsterdam/Francfort, 1609. Some marginal paper thinness. 85 x 123 mm. 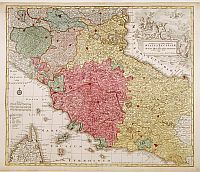 � A miniature map of northern Italy, centered on the city of Brescia. Title cartouche on the lower left corner. First published in 1598 in his "Caert-Thresoor", the plates were executed by the most famous engravers in Amsterdam, including Petrus Kaerius and Jodocus Hondius I. "The atlas set a new standard for minor atlases. The small maps is extremely well engraved. The map reflect the level of cartography in Amsterdam at the turn of the century, where up to date information on newly discovered regions was readily available". - Koeman, Altantes Neerlandici, Volume II, Lan 9. 231 LANGENES, B. Larius Lacus / Lago di Como. Amsterdam/Francfort, 1609. Some marginal paper thinness. 85 x 123 mm. 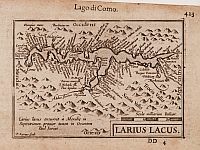 � A miniature map of Italy, centered on the lake of Cosme. Title cartouche on the lower right corner. First published in 1598 in his "Caert-Thresoor", the plates were executed by the most famous engravers in Amsterdam, including Petrus Kaerius and Jodocus Hondius I. "The atlas set a new standard for minor atlases. The small maps is extremely well engraved. The map reflect the level of cartography in Amsterdam at the turn of the century, where up to date information on newly discovered regions was readily available". 236 CERUTTI. Corso del Po Per la Lombardia� Rome, Domenico de Rossi, 1703. Carte d�coup�e en 16 sections, entoil�e et pli�e; petites taches brunes, papier jauni. 570 x 1730 mm. � Carte monumentale du cours du P�. Barbey sculp. - Aliprandi & Pomella, Le grandi Alpi nella cartografia, p. 429. 237 L'ISLE, G. de. Carte du Pi�mont et du Monferrat� Paris, 1707. Limites col. Mouillures, fente de 6 cm en bas du pli central. 483 x 640 mm. 238 L'ISLE, G. de./ BUACHE, Ph. Partie m�ridionale du Pi�mont et du Monferrat. Paris, ca. 1770. Limites en col. d'�poque. Fente de 15 cm le long du pli central. 494 x 639 mm. 239 LOTTER, T. C. Cursus Padi per Longobardiam... Augsbourg, 1770. Beau col. ancien. Carte en 4 ff. formant une carte monumentale du cours du P�. Bel exemplaire. 580 x 455 mm. � La carte se pr�sente ainsi : 3 ff. pour le cours du P� proprement dit et une pl. repr�sentant 10 plans de villes : Milano, Pavia , Cremone, Mantoua... T.C. Lotter married M. Seutter's daughter in 1740 and succeeded him in 1756. Lotter used the copperplate of Seutter; he only changed the name. 241 LOTTER, T. C. Dominium Venetum. Augsbourg, 1770. Beau col. ancien. Bel exemplaire. 495 x 570 mm. � Carte de V�n�tie. T.C. Lotter married M. Seutter's daughter in 1740 and succeeded him in 1756. Lotter used the copperplate of Seutter; he only changed the name. 243 LOTTER, T. C. Lo Stato della Republica di Genova. Augsbourg, 1770. Beau col. ancien. Bel exemplaire. Le panorama de la ville n'est pas colori�. 495 x 580 mm. 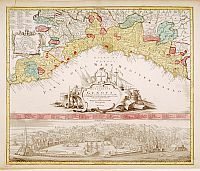 � Carte et panorama de G�nes. T.C. Lotter married M. Seutter's daughter in 1740 and succeeded him in 1756. Lotter used the copperplate of Seutter; he only changed the name. 246 LOTTER, T. C. Novissima... Status Ecclesiae... Augsbourg, 1770. Beau col. ancien. Bel exemplaire. 500 x 580 mm. � Carte des Etats de l'Eglise mais couvrant �galement la Toscane, avec le nord de la Corse. T.C. Lotter married M. Seutter's daughter in 1740 and succeeded him in 1756. Lotter used the copperplate of Seutter; he only changed the name. 249 L'ISLE, G. de./ BUACHE, Ph. 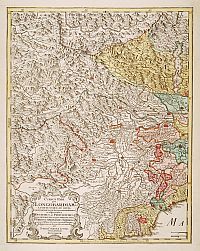 Carte du Pi�mont et du Monferrat� Paris, 1775. Limites col. Rousseurs. 485 x 642 mm. 250 M�NSTER, S. Sicilia. B�le, 1568. Beau col. Bois grav�. 215 x 15 mm. � Carte de la Sicile s�par�e des c�tes nord-africaines par une gal�re. 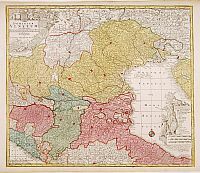 251 LOTTER, T. C. Mappa... Regni Siciliae. Augsbourg, 1770. Beau col. ancien. Bel exemplaire. 500 x 580 mm. � Carte de la Sicile repr�sentant l'Etna en �ruption. 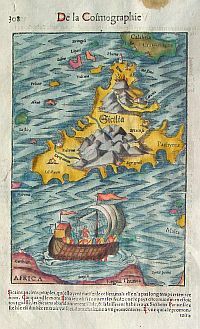 En carton : Ile de Malte. T.C. Lotter married M. Seutter's daughter in 1740 and succeeded him in 1756. Lotter used the copperplate of Seutter; he only changed the name. 252 M�NSTER, S. Calaris Sardiniae Caput. B�le, 1568. Bois grav�. Mouillure marginale. 215 x 179 mm. 253 M�NSTER, S. Sardinia Insula. B�le, 1568. Beau col. Bois grav�. 256 x 154 mm. 256 M�NSTER, S. Florence tresnoble cit� des Tuscans� B�le, 1568. Beau col. Bois grav�. 237 x 360 mm. � Vue panoramique de Florence. 257 M�NSTER, S. La Cit� de Venise tr�s ample & maritime� B�le, 1568. Beau col. Bois grav�. 258 x 388 mm. � Vue panoramique de la lagune v�nitienne. 260 AVELINE, P. / CREPY Pignerol. Paris, 1690-1720. 186 x 311 mm. � Rare. "El�ve pr�sum� de Perelle, Pierre Aveline ex�cuta de nombreuses pl. montrant des vues topographiques de Paris, de villes de province, d'Europe et d'Afrique. A very RARE panoramic view of the city of Pignerol, including a numbered legend in the lower part. The plate is numbered in red pencil in upper right corner. Engraved by Pierre Aveline (Paris, c.1656 - 23 May 1722). He was also a print-publisher and print-seller. He probably trained with Adam P�relle and, like him, specialized in topographical prints. He engraved suites of views of Paris and European and African cities, mixing etching and burin. In 1685 he obtained a royal license for ten years, authorizing him to reproduce "le profil des maisons royales". Among the 412 items that comprise his �uvre, there are only two portraits and two prints of historical subjects. The print carries the "privilege du Roy". With the publishers address of "Crepy". Etienne Louis Crepy (c.1700-1759) was active as an engraver and publisher active at rue St. Jacques a St. Pierre in Paris. He was specializing in maps and topographical prints. In 1731 he acquired the stock of copper plates of topographical content from his father Jean Crepy. Collectors item! - Thieme-B. II, 273 (Aveline).